Former Minister, Sat Sharma, inaugurating macadamization work in Ward No 40 of Jammu Municipal Corporation. 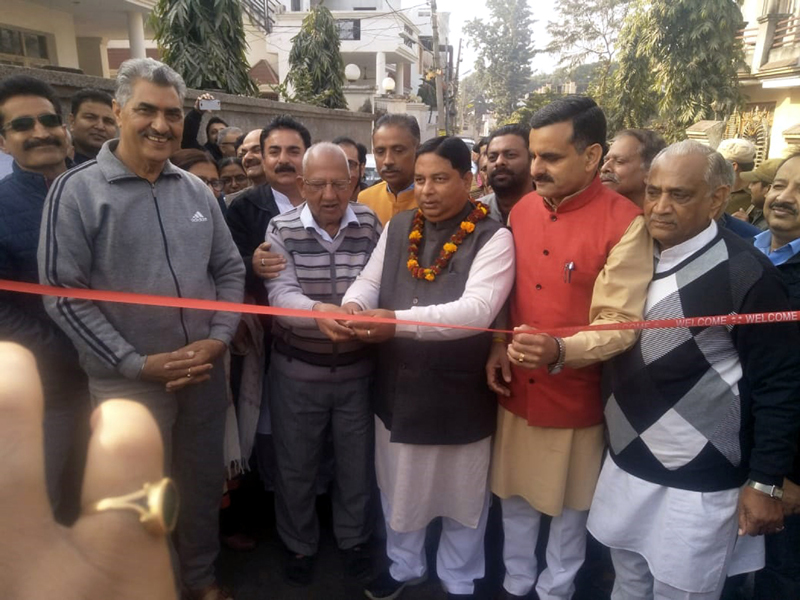 JAMMU, Dec 9: Former Minister and senior BJP leader, Sat Sharma, today inaugurated works of macadamization of two roads in Ward No 40 and 41. The works include blacktopping of 70 metre link road to Durga Nagar from Akhnoor Road and 350 metre link road to Wazir Lane from Akhnoor Road. The total cost of these works is estimated at Rs 12.50 lakh approximately. Sharma was accompanied by Corporator of Ward 41, Sanjay Baru, Corporator of Ward 40 Neelam Nargotra, State treasurer of BJP, Prabhat Singh, district president, BJP Ayodhya Gupta and local residents. Addressing the gathering, Sharma said that blacktopping of these roads will provide better connectivity to the residents of both wards and will help in improving traffic congestion. He said that PWD is taking necessary steps to complete pending works in a shorter time period. He said that more than 90 percent of the major roads including link roads have been macadamized in the past four years. Sanjay Baru and Neelam Nargotra stated that dozens of developmental works that were recommended by former MLA will be taken up in coming days in various areas. They further said that BJP is committed to provide every basic amenity to inhabitants at their doorsteps. Chairman, Development Committee, Mohan Lal Mahajan, president, Ashok Singh Wazir, general secretary, Rakesh Duggal, convener, Rajesh Thakur and Dr Ramesh Gupta were present on the occasion.